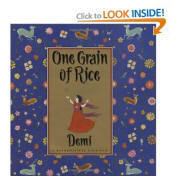 Design a habitant that you can grow rice and test different ways to improve its growth. Design a tool that could be used to count the rice faster than each grain at a time? Could we design a wagon to carry the rice?